A world inside a canyon 13 kilometers length! Typical Iblean mountain canyon, carved by millennia of erosion by the river Pernamazzoni in its upper parts and by Busaitone in the lower parts. It is one of the most picturesque places in Sicily whose main feature is its troglodite appearance : ancient troglodite constructions, carved in deep gorges, with the gentle flow of the river water, the call of the birds and the rustle of the waves. 13 kilometers long, the Cava d’Ispica extends from Modica (in the north where it is called Cava d’Ispica) until Ispica (in the south) where it takes on the name Parco della Forza. Many, many travelers have seen Cava d’Ispica, which until the earthquake of 1693, was inhabited by as many as 6,000 people. A curious universe of cavemen, who dazzled erudite travelers in the 17th century who in turn captured the area (art tours) in many of their artistic sketches. This site is a spectacular show of Christian catacombs, prehistoric burial sites, churches, castles, houses and many other structures carved into the rock from the Neolithic period until, in fact, 1693. 4000-odd years worth of things to dig up in the limestone of the Iblean mountains. This precious artistic and archeologic patrimony is immersed in an environment rich in vegetation. Here, overlooking the Mediterranean is carob, wild olive trees, palms, oaks, sycamores, and euphorbia, while in the undergrowth are ferns, ivy, scented sage, and asparagus. The valley, cultivated mostly with gardens and orchards, is full of figs, nuts and pomegranates. At this point, the fauna is scarce, however, one can still encounter the occasional porcupine. 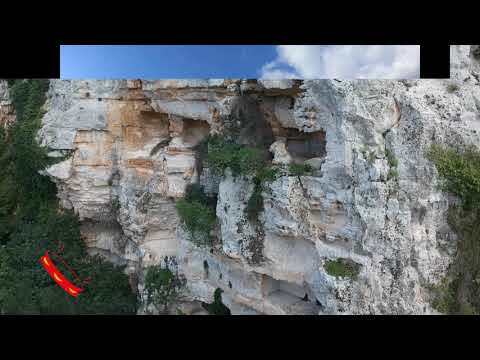 If you are passing through this beautiful archological and naturalistic area and imagining going from north (Modica) to south (Ispica), follow the map. And it takes 6-7 hours! Chiesa di San Pancrati, one of the oldest in the Iblean area, dating to the middle of the 6th century, it is a Church with three naves, built with megalithic blocks. Contrada Baravitalla (Baravitadda in dialect), that hosted the ancient medieval town of Isbarha, occupies the rocky plateau north of Cava. In the area are the remains of hut and signs of a prehistoric village from the bronze age, especially an ancient tomb certainly belonging to an illustrious person, characterized by ten fake slabs on either side of the entrance. The tomb consists of two rooms, separated by a second door: an oval antechamber and a funeral room of the “oven” type. Grotta dei Santi, probably from the Byzantine epoch with frescos of 36 saints. The Paleo-Christian catacomb (4th-5th century BC) of the Larderia (photo), with an expanse of more than 500 square meters, is really impressive for the number of burials. (464 tombs). Continuing from the Larderia for about 400 meters to the south-east, you will find the Grotta della Signora (15 x 7 meters), the ancient source of sacred water, whose walls are home to graffiti carved in the soft limestone of the prehistoric Paleo-Christian eras. Further is the Church ruins of San Nicola (13th – 14th century), with the remains of five devotional frescoes, among which, on the left wall, a fresco representing the “Madonna and Child”. The complex of troglodite caves, the Grotte di Santa Maria, have extraordinary Church ruins on two levels, with traces of paintings on the walls. The large complex of troglodite caves, the Grotte Cadute, extends to at least five levels. The Spezieria, (Apothecary) is a large room with a quadrangular plan with walls that have dozens of grooves suggesting shelves and closets to neatly store pots and containers of ointments, creams, potions, and herbs of various kinds. A hole dug into the limestone floor looks like a mortar, so much so that some scholars speculate that the site was used as a kind of pharmacy, hence its name ‘spezieria’, as it is also called in dialect. On the same side of the canyon, you can visit Salinitro, one of the most suggestive complexes where visitors can see other tombs and caves on top of each other, partly collapsed. Between the high walls of the canyon, in a very suggestive environment, you arrive at the so-called Castle (photo, from a 18th century print) amazing and monumental troglodite works. A steep limestone wll, thirty meters high, with four floors connected by internal stairs, with grooves for climbing and external stairs whose collapse hides all but the last floors. The rooms are in a rectagular plan or square shape with niches in the walls. Almost all have light that comes from a long corridor that runs along the external wall. A short distance from the Castle is the ruins site of Capreria and then, following the lower route of Busaitone, you come across what is called the Convent. Set in almost an inaccessible site, the convent looks like a open complex in the midst of a precipitous cliff on the banks of Cava Ispica. On the upper floor you can see a corridor in which there are small rooms, rectangular or square, resembling real monastic cells. The supposition that this might be a “monasterion” came to be because of a small shrine named Santa Alessandra, discovered a brief distance from the Convent and built with two separate rooms. In the first you can see, inside a dark frame, the remains of a fresco which most probably is the figure of a saint; the second, much smaller room, has a hard, rocky floor in which you find a circular hole for the collection of water. This water, rich in sulpher, was and still acts as a miraculous cure for skin diseases. It is ancient tradition that you receive this cure wearing your garments. Situated at the south-eastern opening at the base of Cava Ispica, the current name of the area, “Strength”, comes from a common corruption of Fortilitium, meaning “small fort”. In fact, on the rocky spur, there stood a small fortified dwelling of the Statella family. At the foot of the castle, in the canyon itself, was the ancient town Spaccaforno: both were abandoned after the earthquake of 1693. The antiquarium in the park houses artifacts from the first half of the Bronze Age and until 1693, found in the area. It is the highest part of the canyon where there was an immense castello (fortilitium) defended by overhanging rocks and, from the slaughterhouse, with a moat over which there was a drawbridge. You entered the castle through a large wooden portal flanked by two smaller doors. Today what remains are a few walls that survived the 1693 earthquake. It is interesting to visit the scuderia, (stable) (10 meters by 10 meters) an enormous cave where they kept the horses of the “Fortilitium”. Here there are also troughs cut into the rock, and eyelets to tie the anmals. There is also an upper part where the hay was kept, rooms used for storage, and the Hall of the Warriors. Holes in the walls can be seen carved into the rock, where there were fixtures, wooden planks, used to hang weapons, clothing, and animal trappings. Also here is some preserved equestrian graffiti. Centoscale (photo) is a rectangular tunnel with 280 very steeply raked steps carved into the rock floor. It was probably a deep well used to obtain water. On the upper right stretch there are two windows, carved in rock, for light and air intake. A little further down, there are two other passages, placed at the same depth, one to the right and one to the left, while a last tunnel, on the right side and at the end of Centoscale, is connected to a cistern. It is certainly a unique work in the panorama of the excavation of ruins. The Marchionale Palace (15th century), in terms of the fortilitium, was a sumptuous dwelling of the Statella family. In tatters after the earthquake, we can now make out the service rooms, and other rather elegant rooms, paved with asphalt and limestone slabs and terracotta tiles. The base of a column located in the north-east leads to the assumption that a monumental plan disappeared. The Church of the Annunciation, partly excavated and partly still built, has a large rectangular room where it is said that there had been a good seven altars, of which today we can identify only three. Several graves were discovered, dug directly into the rock. 11 January 1693: an earthquake of catastrophic force hit southern Sicily. Many towns were rebuilt on new sites. Ispica is one of these. Before being named Ispica it was called Spaccaforno and it was located in this canyon creating one of the most complex and significant ruins sites in the entire area. The ruins of the houses are distributed on various rocky steps, connected by stairs cut into the rock and having highly advanced characteristics: skylights, chimneys, gutters and windows. Located in the bottom of the valley, it was the chuch belonging to the village of Spaccaforno. In a major state of ruin, perhaps Paleo-Christian catacombs, it was transformed into a Church with the apse in the east. On its inner east side there appear to be frescoes of the Byzantine-premusulmano period (about the 6th-8th century); one of which might represent Pope Gregory the Great. During the Norman-Swabian period (about 12th-13th century) was probably painted the Madonna and Child (“Basilissa”, or “Queen sitting on the throne”) in a lunetta, enclosed by an semi-circular arch with geometric and spiral motifs, once painted. The seven small sacred figures painted underneath the lunetta are of the 16th century (from left to right: Christ at the Column, St. John, St. Andrew, St. Paul, St. Luke, St. Domenic, St. Francis). Going inside the canyon to the south, on the left of Busaitone, on the same side where you looked at the so-called “Uruti Caruti” (collapsed caves), we find the site of this cemetery, very near to the Church of Santa Maria. It seems to be a necropolis of the 4th century: on the walls of one of the tombs a Christian symbol is engraved. In the complex there are 60 earthen graves, many overlapping and a large number of sarcaphogi carved in rock. The first section, of the two in which it is possible to distinguish the cemetery, includes 25 tombs disposed in various ways; in the second section, that which extends north, there are 34 graves. On the opposite hill, you can visit the “Salinitro”, that has tombs and caves overlapping and is in part collapsed. It is a tannery (cunziria in Sicilian) where animal skins were worked and which were very common in Sicily, especially close to the rivers, and so, it could not fail here. The tannery is located just opposite the Church of S. Maria della Cava and inside it consists of twenty rectangular tanks, close to each other, where they tanned the animal skins. Trades disappeared over time, but they once supported the economy of these settlements. In a huge crack in the rock face, approximately 80 meters high, there are numerous cells, arranged on different levels and connected by a ladder. Those on the lower levels are arranged around a small rectangular shrine, which contains a pictoral panel with a saint. In the district of “Scalauruni”, a little before Santa Maria, the key to these settlement ruins is perhaps that it was the place of the hermitage of Saint Hilarion in 360 BC. As told by the Sicilian historian, abbot Vito Amico (1757): “They point to these parts, to this cave dwelling, for ancient testimony to the dwelling of Saint Hilarion, in which you climb stairs.” (the said “scalauruni”, carved in rock, still exists). Next there are two other caves where there were the dwellings of his disciples, Gazano and Esichio. The monumental catacombs of San Marco, two kilometers from the Parco della Forza, constitute strong testimony to the area’s Christian presence during the late Roman era. Finally we close with a joke that is not really a joke: if you intend to hide any traces of yourself, this is the ideal place!